Editor’s Note: The plates reproduced in the text below are placed contextually rather than numerically. In the original study they were located in a section just before Mining. Lepidolite was once used mainly as a source of lithium salts, but during the past three decades the ceramic industry has absorbed the bulk of domestic production. The mineral is used directly in the manufacture of glass, as it not only is an excellent fluxing material, but it increases the luster, weather resistance, electrical resistance, and strength of the product. More important, it reduces the coefficient of expansion, thus making the glass more resistant to thermal shock. Lithium glasses are in great demand for high-pressure gages [sic], electronic tubes, and other devices subject to mechanical stresses or sudden temperature changes. Lepidolite is also an ingredient of many high-quality porcelains and enamels, in which it is an effective opacifier. Plate 10-A. Fine-grained lepidolite. 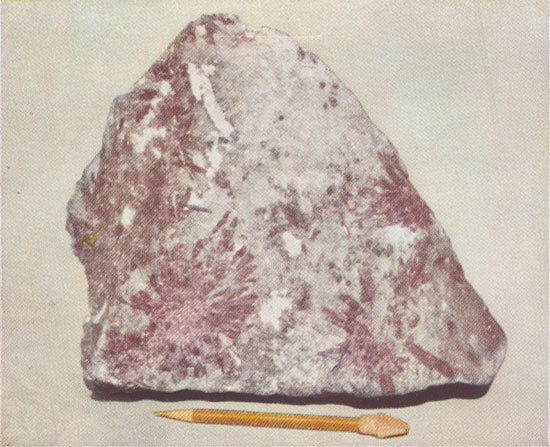 This pinkish to lilac lepidolite is typical of the best material obtained from the south ore body of the Stewart mine. 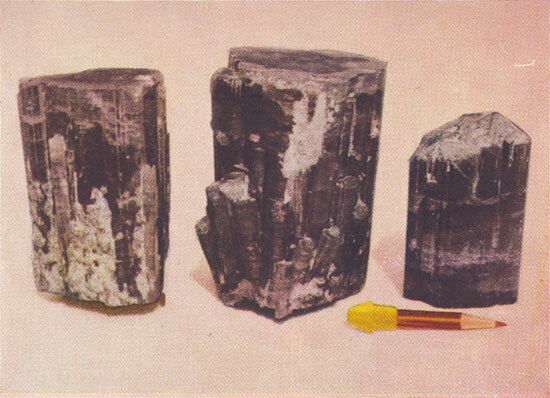 Lepidolite containing 3 percent Li2O has generally commanded a price of $15 to $27 per short ton ($5 to $9 per short-ton unit) at the mine, but during the period 1945–47 prices rose to as much as $17 per ton-unit, or about $50 per ton for 3-percent material. Prices have dropped since 1947, mostly because of imports from southwest Africa. 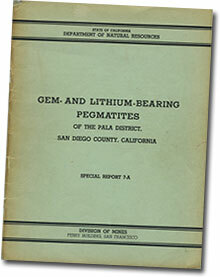 Most of the lepidolite shipped from the Pala district was obtained from the southern part of the Stewart pegmatite. Small quantities of the mineral were taken from the Pala Chief and Vanderburg-Katerina pegmatites also, and at times from the Tourmaline King, Tourmaline Queen, and numerous other dikes. The bulk of the output was processed as a source of lithium and lithium compounds. 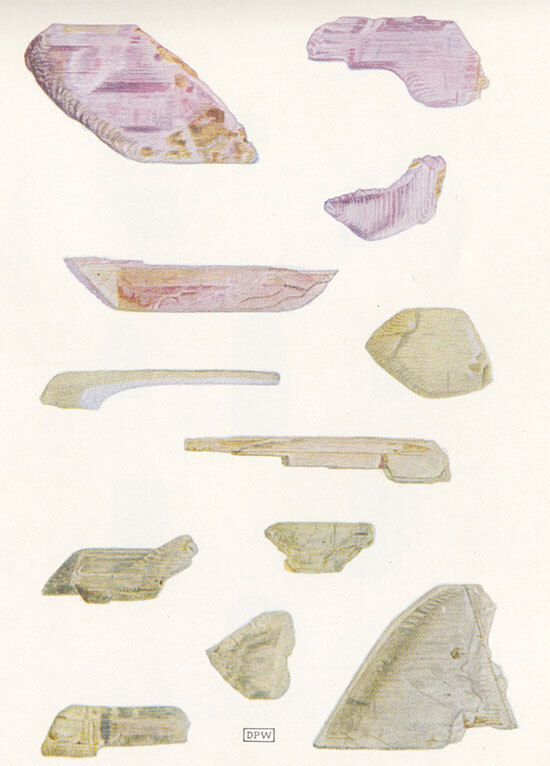 A little material was polished and carved, and some of the lepidolite with sprays of opaque pink tourmaline was highly prized as specimen material. Plate 10-B. Very fine-grained lepidolite. This lilac to bluish lepidolite with albite and abundant pink tourmaline is typical of material obtained from the north ore body of the Stewart mine. The largest concentrations of lepidolite occur as dense aggregates of small, white to deep-purple flakes and plates. In general those of finest grain and most bluish, blue-gray, or darkest-purple color contain the highest proportions of lithium. Some of the waxy, bluish aggregates contain more than 5.5 percent Li2O, but the proportions of lithium oxide in most of the coarser pink- to lilac-colored material that was mined ranged from 2.5 percent to 4.5 percent. The lepidolite of the Pala district is a common pocket constituent. The only known commercial concentrations are in the central parts of the dikes, especially in the footwall parts of massive quartz and of other quartz-rich units of very coarse-grained pegmatite. Even the purest concentrations grade outward into stockworks and ramifying veinlets of lepidolite in quartz or other pegmatite. Commonly associated minerals are quartz, albite, tourmaline, muscovite, and spodumene. Plate 11-A. 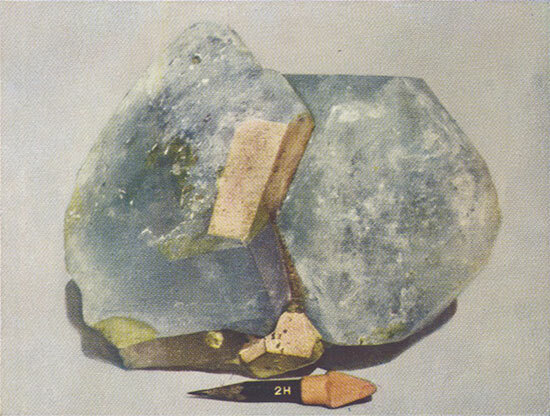 Crystal of lithiophilite. With alteration products, Stewart Mine. Pale tan to flesh-colored lithiophilite is rimmed successively by flesh-colored hureaulite, deep reddish-brown sicklerite, buff to pale tan salmonsite, and salmonsite and other phosphate minerals stained with manganese oxides. In addition there are numerous crystalline aggregates of blue strengnite, purplish purpurite, ad canary-yellow stewartite. 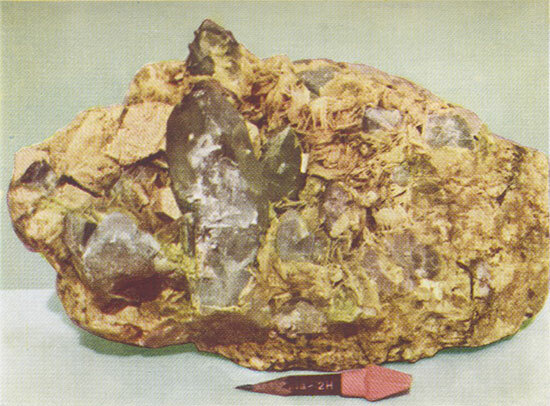 A thin veinlet of hureaulite (palaite) and stewartite cuts diagonally across the specimen, which is 5½ inches long. Earl Calvert collection. The concentrations of lepidolite that were mined were broken out, sorted underground or at the portal of the mine, and hauled in lump form by wagon or truck to such rail shipping points as Temecula and Fallbrook. In the largest ore bodies there was little difficulty in obtaining fairly pure material, or at least material contaminated only by quartz or small quantities of spodumene and feldspar. Although most of the Pala lepidolite was used as a source of lithium salts, some of it obtained during the last periods of operation was employed in glass making. In addition, both caesium and rubidium were extracted from several tons of concentrates that were refined in Germany before 1900 and in Los Angeles during the period 1935–1938. Spodumene and amblygonite are employed directly in the manufacture of certain glasses to neutralize shrinkage during cooling, and are also ingredients of some ceramic mixes. Most of the domestic consumption of these minerals, however, is founded upon their use as sources of lithium metal and lithium compounds. Salts of lithium are employed in pharmaceuticals, storage batteries, flares and fireworks, fluxes, and in curing meat, manufacturing textiles, refining metals, smelting iron ore, and in dehumidifying air in air-conditioning equipment. Lithium hydride has been employed as an effective transporter of hydrogen in self-inflating rafts, balloons, and other devices, and the metal is a minor constituent of some special-purpose alloys. Lithium also promises to become important as a raw material for certain types of nuclear reactions. The average price quoted for spodumene during recent years has been about $30 per short ton of clean cobbed or milled material, generally with a minimum Li2O content of 5 or 6 percent. Prices for amblygonite, which contains more lithium, ordinarily have ranged from $40 to $50 per short ton. During World War II prices for spodumene concentrates rose to $50 or more per ton, and then dropped considerably, even before the close of hostilities. Spodumene occurs in the central parts of numerous dikes in the Pala district, and is most abundant in the Stewart, Pala Chief, and Vanderburg-Katerina. It is associated chiefly with very coarse-grained anhedral quartz, and the two minerals generally form cores or intermediate zones. Such units overlie most large concentrations of lepidolite, and in a few places occur sparingly beneath such concentrations. Most of the large spodumene crystals are slightly altered; in general, the pegmatites that contain the largest concentrations of lepidolite contain also the highest proportions of completely or nearly completely altered spodumene. Coarse masses of amblygonite occur mainly in the outer parts of the quartz-spodumene zones, and also in overlying units rich in coarse quartz and giant crystals of perthite. Most of the pegmatites in which the amblygonite occur are so thin that it is mined along with lepidolite and spodumene if at all. The amblygonite and spodumene commonly are associated with albite, muscovite, and lithium-iron-manganese phosphate minerals. A little non-gem spodumene has been recovered from the Pala pegmatites by hand picking, but production from a given dike never has been sustained for appreciable periods of time. Much of the mineral has been so thoroughly altered that its lithium content is very low; and its characteristically thin, lathlike habit makes it difficult to recover the mineral efficiently by the usual hand-sorting methods. In most dikes spodumene is not readily obtained in large quantities as a by-product, mainly because it does not occur in the same rock units as the minerals ordinarily sought. The altered nature of the spodumene also makes practical difficulties in mining, as it results in badly broken and otherwise heavy ground that requires timbering in some places. In only a few pegmatites has amblygonite been encountered in sufficiently large concentrations and near enough to masses of other desirable minerals to make mining economic. The outstanding examples are in the Stewart and Katerina mines. Commercial feldspar is used chiefly as an ingredient of glasses, glazes, pottery, and other ceramic products. It is employed also in various ways as an abrasive, building material, and grinding agent. It is generally graded on the basis of its freedom from iron and its content of free silica. Small quantities of admixed quartz commonly are accepted for most uses of ground feldspar, but the tolerance for iron is very low in nearly all grades. 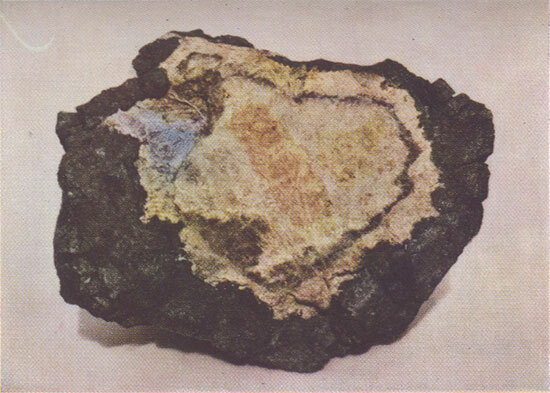 Biotite, garnet, and other iron-bearing impurities impart an objectionable discoloration to most ceramic products in which tlie feldspar is used. Pegmatite feldspar ordinarily is hand cobbed at the mine, and then is shipped to nearby plants for grinding and blending. During recent years feldspar from pegmatites and from finer-grained igneous rocks has been recovered by flotation methods, which have proved satisfactory. Most mine-run feldspar is a mixture of microcline or orthoclase and sodic plagioclase. Commonly a little quartz also is present. Prices for such material at or near the mine range from $3.50 to $12.00 or more per long ton; a general 25-year average for all common grades is nearly $6.00. The distance of most western deposits from principal centers of demand makes it economic to produce and ship only the best grades of material. Some extremely pure potash feldspar, used chiefly as high-grade abrasive material, yields returns of $2000.00 or more per ton, but the quantity of such material marketed during a given year is ordinarily measured in pounds, rather than tons. A little potash feldspar has been recovered as a byproduct during past operations in the Stewart mine, and in 1949 a small stock pile still lay in the Main cut. Not only the Stewart, but many of the larger and more bulbous dikes in the Pala district contain large masses of perthite, with so little biotite or other iron-bearing impurities that the proportion of quartz would be the principal consideration in any selective mining. Many cores and intermediate zones that are rich in massive quartz also contain several tons of individual crystals and crystal groups of top-quality perthite. Other high-quality material, and also some of inferior grade, occurs in the intermediate zones and cores of coarse, blocky perthite. Although graphic granite has been mined and marketed in some districts, this material, so abundant in the Pala area, is probably not salable, chiefly owing to the geographic location of the deposits. In general, the parts of the Pala dikes that contain coarse feldspar of best quality occur above the horizon of the pockets, and below the hanging-wall units that are rich in graphic granite. Inasmuch as they do not occupy the same position as lithium- and gem-bearing parts of the dikes, these feldspar concentrations can be recovered only by additional mining, rather than as byproducts from the material removed during operations for the other minerals. Some of the pocket pegmatite contains a clear variety of perthitic orthoclase and microcline that is known in the trade as “dental spar.” It is used as an abrasive in dentistry, and ordinarily commands prices of $1.00 to $5.00 per pound. Coarse crystals of clear potash feldspar are particularly abundant in the Pala Chief, Tourmaline King, Tourmaline Queen, San Pedro, Katerina, Senpe, and El Molino pegmatites, and exceptionally large quantities of it are present in the main dump at the Senpe mine. 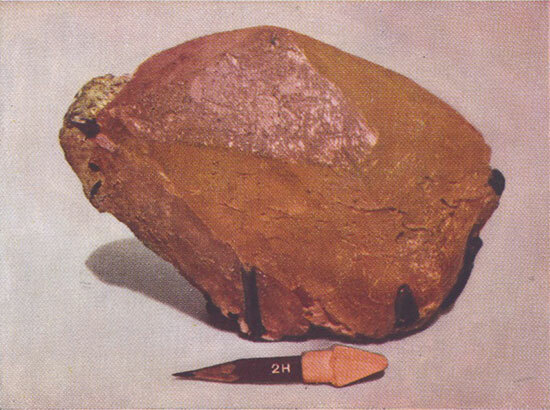 Much of this feldspar is so deeply corroded and ironstained, however, that it would require much careful cobbing and trimming before iron-free and quartz-free material of dental quality could be recovered. Much of the tourmaline in the pockets of the Pala pegmatites occurs in large crystals that contain clear, unfractured material admirably suited for gem uses. The mineral is graded on the basis of size, color, or color combinations, transparency, and freedom from bubbles, inclusions, cracks, and other imperfections. Material of red, pink, salmon, green, dark blue, black, and other colors has been cut into gem stones, but the pale- to deep-pink tourmaline undoubtedly represents the dominant commercial production, in terms of both bulk and value. Its color, which contrasts sharply with the much deeper red of Brazilian rubellite, is very attractive. Most material of good quality has commanded prices of $2.00 to $35.00 per carat in the cut form, depending largely upon the color or colors involved. In general the recent prices have been slightly higher than heretofore. The period of greatest demand for tourmaline of gem quality was in the early part of the century, when the principal market was in China. The Chinese prized the pink and red varieties of the mineral very highly, and they carved and polished it into many different forms. With the collapse of the Chinese dynasty in 1912, however, most of the Oriental market was eliminated, and there resulted a drastic curtailment of mining for tourmaline in the United States. The best grades of tourmaline are most popular for facet-cut gems. The stones are cut parallel to the length of the crystals in order to reduce waste of usable material. Thus, such elongate cuts as baguettes, triangles, kites, lozenges, trapezes, and the like, are commonly used for this mineral. This style of cutting is best also in terms of color of the finished stone, as the lightest tints can be obtained when the mineral is viewed normal to its elongation. Plate 8-A. Tourmaline. Facet- and cabochon-cut stones. Note the cat’s eye material and the range of colors in the clear stones. F. G. McIntosh collection, California Institute of Technology. Inasmuch as the quality of color is generally considered of more importance than fire and brilliancy in tourmaline, the relatively flat types of table, baguette, and step, or trap, cuts are particularly popular. Some stones of exceptional size, 100 carats or more, have been obtained from Pala material. Like those from most other districts, however, such large stones are rarely unflawed. Some tourmaline is cut brilliant, and shows moderate sparkle and fire, especially where the table of the cut is parallel or nearly parallel to the base of the crystal. There are many color variations within single crystals, especially in the green types. Some variations are gradual, others are sharply bounded. 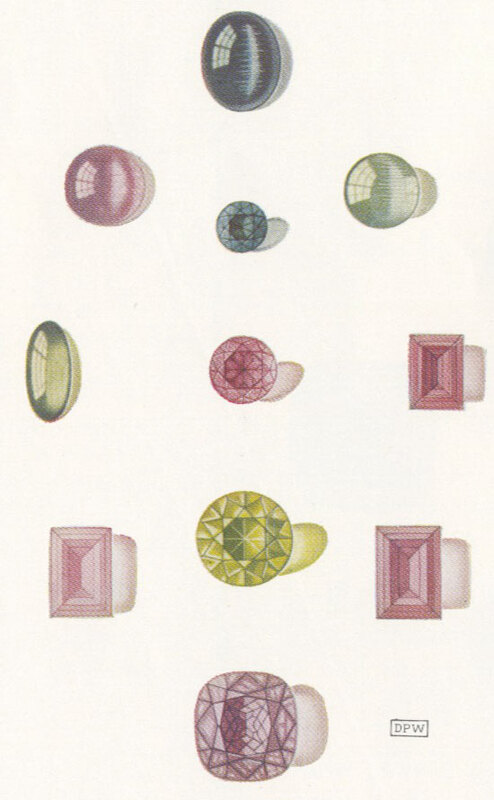 Pink and green, or pink, white, and green stones, are the most popular among the bicolor and multicolor gems, especially where the contacts between different colors are sharp (pl. 8-B). Plate 8-B. Bi-colored cut stones. F. G. McIntosh collection, California Institute of Technology. The poorer types of material, generally marred by cracks, feathers, and tubular cavities, are cut in cabochon form, or are polished and carved into various types of ornaments. Especially suited to this kind of treatment are large fragments of partly flawed tourmaline broken from crystals of pale to deep-pink color. They were especially prized by the Chinese. An unusual type of tourmaline, found in only a small proportion of the crystals, is marked by groups of subparallel cylindrical cavities or threadlike inclusions, which give it a well-defined chatoyance. These stones yield good cat’s eye cabochons of various colors. Some deep-blue and bluish-black material that is relatively free from flaws was used during the recent wartime period as frequency-control plates in special electrical equipment. Only a small proportion of these crystals was found to be usable, as the tolerances for flaws, inclusions, and other irregularities are very strict. Tourmaline is also the basic element of certain types of pressure gages, in which its piezoelectric qualities are used. Some types of flawed material are acceptable for such equipment, and the specifications have been outlined in detail by Frondel  . Material that is too dark to yield attractive gems can be used, and a quantity of large, dark-colored crystals and crystal fragments that had accumulated in shops and storage sheds was quickly absorbed by the recent wartime demands for such devices. Gem tourmaline is strictly a pocket mineral, and little but schorl occurs in the regular pegmatite zones. 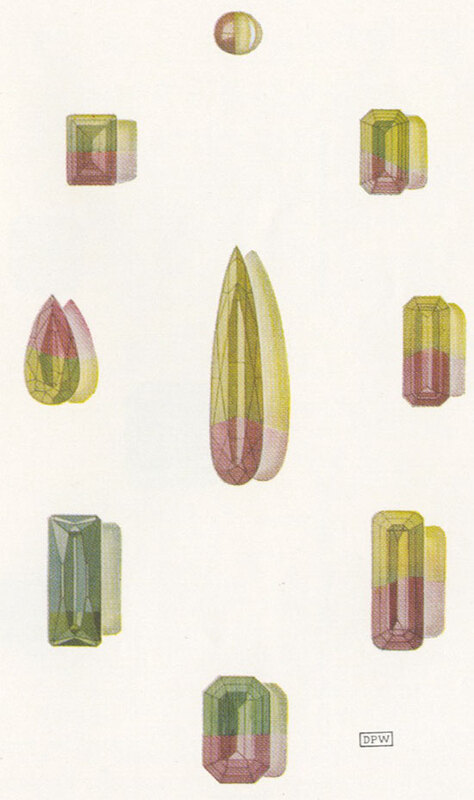 The gem crystals are most abundant in the Tourmaline King, Ed Fletcher, Tourmaline Queen, in parts of the Stewart and Pala Chief, and in several dikes on Hiriart Mountain. Ordinarily they are not at all common in dikes or parts of dikes with high concentrations of spodumene. The associated minerals include quartz, albite, orthoclase, microcline, muscovite, and lepidolite, and in most places the crystals of tourmaline are encased in white to pinkish clay. Specimen material, including both individual crystals and crystal groups, has found a ready market. Many of the crystals contain material of more than one color, and are very attractive. Small, well-formed pencil-like crystals have been sold in all parts of the world. Aggregates of tourmaline crystals and other coarsely crystalline minerals, generally known as matrix specimens, are present in thousands of collections. These specimens ordinarily contain tourmaline with cleavelandite, quartz crystals, mica, microcline, and orthoclase. The pink, green, yellow, and colorless gem varieties of spodumene constitute a small proportion of the total spodumene in the Pala pegmatites. The pink to pale-purple kunzite, sometimes termed “California’s own gem,” has been much sought after throughout the district since its discovery on Hiriart and Chief Mountains in 1902. It is valued mainly for its transparency and its exceptionally clear and beautiful colors. In addition it was very fashionable during the early part of the century because of its rarity and the fact that it was then the only exclusively American gem. During more recent years, however, kunzite has been obtained commercially from deposits in Madagascar and Brazil. The kunzite occurs with the green hiddenite and the white to straw-yellow triphane varieties of spodumene. In many respects they yield gems almost as attractive as kunzite, but they never have found as ready a market or as much favor among collectors. The Pala hiddenite is a very pale green, and hence not as highly valued as the deeper-colored material from North Carolina, and the triphane does not have colors sufficiently deep or attractive to command the attention received by kunzite. The kunzite itself ranges from very pale rose-pink through lilac to pale purple. Some of it has a faint bluish cast, and yields cut stones of great beauty. Plate 9. Spodumene. Facet-cut stones. F. G. McIntosh collection, California Institute of Technology. During the period 1903–14, when kunzite and other types of gem spodumene were very popular, rough crystals of good color and high quality commanded prices of $10.00 to more than $50.00 per ounce. The price for any given piece depended then, as now, upon the nature and depth of its color. Facet-cut stones were marketed at prices of $4.00 to $30.00 per carat, with a probable average cost of not more than $8.00 per carat. Prices gradually dropped during later years, until cut kunzite of top quality was sold for as little as $5.00 per carat in the middle 30’s. More recently, however, the popularity of gem spodumene has again increased, and current prices for good rough material average about $15.00 per ounce. Facet-cut stones are sold for $2.00 to more than $40.00 per carat, and most flawless stones are priced at $15.00 or more per carat. Gem spodumene ordinarily is facet cut, for maximum brilliance, and most stones are cut very deep, so that the strongest possible color is obtained. The mineral is markedly pleochroic, and the deepest colors are seen when the stones are viewed parallel to the long axis of the crystal. Thus the limiting factor for size of top-quality cut stones is the thickness of the bladelike or rodlike source crystals. For optimum color and brilliance, such stones are cut with their tables nearly but not exactly perpendicular to the long axes of the crystals. The mineral is not an easy one to prepare as a gem, because of its two directions of perfect cleavage and its consequent tendency to break near the edges during cutting. Very careful sawing of the original gem blanks, however, ordinarily eliminates much of the objectionable chipping and “napping off” during subsequent grinding and polishing. Gem spodumene is fairly soft, and when subjected to hard usage its edges gradually lose their sharpness and its facets become somewhat dimmed. The color of some stones fades upon prolonged exposure to sunlight. This is most serious with the green, lavender, and pale-purple to bluish varieties, but the colors of most lilac, pink, and yellow stones appear to be very nearly permanent. Exposure to a source of strong X-rays changes the color of spodumene to an intense light green, but the mineral reverts to its original color when exposed to sunlight. The green color appears to last indefinitely if the mineral is kept in darkness. Gem spodumene is thermoluminescent and possibly triboluminescent. It is strongly phosphorescent when exposed to X-rays, ultraviolet rays, radioactive emanations, and high-tension electric currents. Plate 7-B. Pala Chief mine. 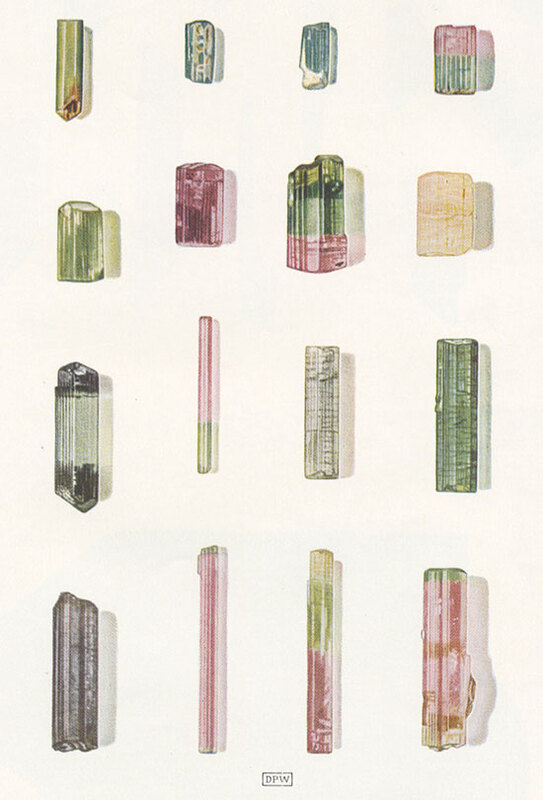 Pink to lilac—kunzite; colorless to yellow—triphane; green—hiddenite. The rough crystals of clear spodumene are blade-, lath-, or rod-shaped, and nearly all are deeply striated, grooved, and etch-pitted. Some are twinned, with the twin planes parallel to their flat faces. Multiple twinning, involving five or more planes in a single crystal, is known but is not common. In most cut stones the twinning does not appear to be objectionable, and few of the twin planes are visible upon even the most careful scrutiny. Most crystals are less than 2 inches long, but some are at least 15 inches long and weigh 24 to 27 ounces. The short, thick crystals, characteristic of several pegmatites on Hiriart Mountain, yield relatively large cut stones, some of which weigh more than 200 carats. Many kunzite crystals are attached to quartz, and most of those that have not been removed from the clay matrix in which they are commonly enclosed are clearly unaltered remnants of larger crystals, which in turn are typical of the coarse, jackstrawlike aggregates of spodumene in massive quartz or other minerals. The gem material thus appears to represent spodumene that is indigenous to some of the inner pegmatite zones. Plate 13-C. Short, prismatic crystals of aquamarine. San Pedro mine, Hiriart Mountain, Pala District. T. W. Warner collection. California Institute of Technology. Commercial beryl, which is used mainly in ceramics and as the principal source of beryllium metal and beryllium compounds, is so rare in the Pala pegmatites that its potential economic significance seems negligible. Gem beryl, on the other hand, is widespread, and has been recovered during the mining of numerous pegmatites. It is a minor constituent of some pockets in which it occurs as colorless to white goshenite, blue aquamarine, and pale-pink to peach-colored morganite. Plate 13-B. Crystal of morganite. Of exceptional size and deep color. Himalaya mine, Mesa Grande district. T. W. Warner collection. California Institute of Technology. The Pala beryl yields excellent cut stones. The morganite is particularly attractive and in general has a peach color that is in marked contrast to the pure pink of the Brazilian morganite. Square, baguette, table, and various types of step-cut stones are most popular. Generally they are cut very deep, in order to preserve as much color of the rough material as possible. Most good crystals yield stones of beautiful transparency, and many are of perfect quality. Others, however, are marred by tiny feathers or by very fine tubular cavities. Clear quartz is abundant in the pocket-bearing parts of most pegmatites, where it commonly forms large crystals. Although they are by no means as attractive as some of the other gem minerals, these crystals have yielded excellent cabochon and facet-cut stones. Colorless, smoky, milky, and rose-colored varieties have been used in this way. In addition, some crystals have been fashioned into polished spheres, and others have been carved. 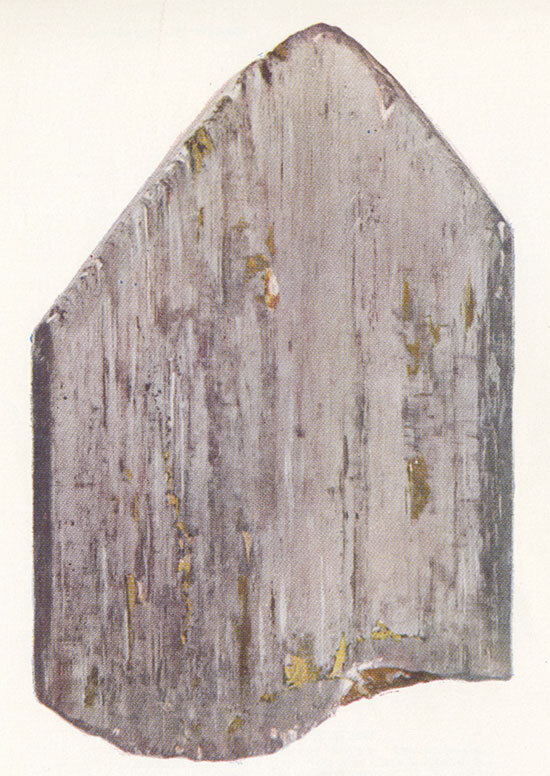 The pale-rose quartz in the cores of several dikes on Pala Mountain has been most popular for such use. A little of this material is sparsely rutilated. Plate 12-A. Matrix specimen from a gem-bearing pocket. Tourmaline Queen mine. Prismatic crystals of quartz aggregates of cleavelandite tablets, and corroded crystals of orthoclase (upper left), with scattered small crystals of lepidolite and pink and green tourmaline. Some of the clear crystals of quartz appear to be of “radio grade,” as they meet certain tolerances with respect to the amount and distribution of twinning, inclusions, gas bubbles, and other flaws. Such material is in considerable demand at present, and commands prices of 50 cents to nearly $40 per pound, depending mainly upon the size and grade of individual pieces. The usable crystals are cut into oscillator plates of specified thickness, and these plates are employed for frequency control in radio, telephone, and special electrical equipment. Quartz crystals were obtained for this purpose from the Senpe pegmatite during World War II, and small quantities of acceptable material were recovered from them by the Universal Microphone Co. of Inglewood, California. Crystals in other mines also may be satisfactory, but the proportion of clear quartz reasonably free from twinning generally is too small to be of economic interest. Specimen minerals have constituted a significant proportion of the output from the mines of the Pala district, although few have been mined and sold commercially. Most of them have been obtained by mineral collectors, who have kept them in their own collections or have exchanged them for other minerals. Matrix specimens from pockets in the pegmatites have been most popular in this connection. They commonly include quartz, tourmaline, spodumene. orthoclase, cleavdandite, muscovite, lepidolite, and other, rarer minerals. In addition, specimen material from the Stewart mine has achieved wide circulation, chiefly in the form of sprays of opaque but attractive pink tourmaline crystals in massive aggregates of fine-grained lilac to blue-gray lepidolite. Some exceptionally fine crystals of gem minerals are valued too highly by their owners to be cut up into stones, and others, although of great value as specimens, do not contain enough unflawed gem material to warrant further treatment. An excellent example is the beautifully crystallized peach-colored beryl obtained during World War II from the Senpe mine, chiefly as a by-product from operations for clear quartz. Few of these beryl crystals contain enough clear material to yield cut stones of very large size, although there are some noteworthy exceptions. Also of considerable value are some rare minerals, notably the crystals of lithium-bearing phosphates and their pseudomorphs in the Stewart pegmatite. Many of the dumps in the district have been worked and reworked for inadvertently discarded fragments of valuable minerals, and a few of the dumps at the better known mines have been screened as many as eight different times. Even so, it is possible to collect very small fragments of tourmaline, kunzite, and other gem material on the surfaces of many dumps after periods of heavy rains. The main dump at the recently reopened Katerina mine was the object of critical scrutiny by hundreds of amateur collectors during the period 1947–49. In connection with guided trips through the mine, such persons have been permitted to collect material from the dump for a nominal fee. Plate 12-B. Line rock. Thinly and sharply layered line rock (above) adjacent to more homogeneous rock (below). South side of Hiriart Mountain. In addition to the lithium and gem minerals, a little ornamental and monumental stone has been obtained from the pegmatites at irregular intervals. The graphic granite yields rather attractive patterns on polished surfaces, and has found favor for garden ornaments and, in rough form, for walls and other decorative structures. The line rock, especially garnet-rich types, has been used locally for fireplaces and monuments. 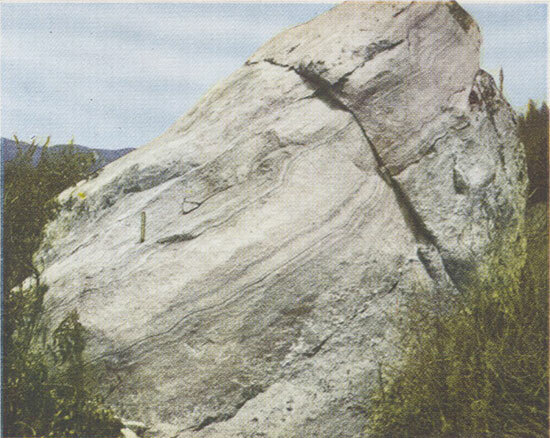 A little quarrying of line rock boulders was done on the south face of Hiriart Mountain, not far from the Ashley Ranch house. 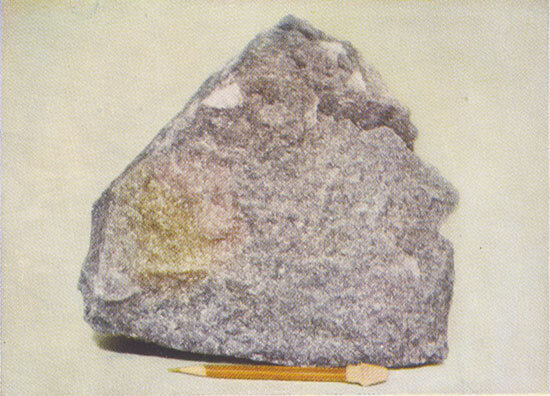 Plate 12-C. Coarse-grained graphic granite. With fine-grained quartz-albite-perthite-muscovite-garnet pegmatite. Distribution of the two rock types is made clear by relatively rapid weathering of the fine-grained pegmatite. South side of Hiriart Mountain. Nearly all the deposits of lepidolite and gem minerals in the district were discovered through the tracing of float material to the source ledges. Loose fragments of lepidolite, tourmaline, and euhedral quartz, which were strewn on some slopes and in numerous gullies, were found to be particularly good indicators of pocket pegmatite higher on the hills. In a few places unusually rich concentrations of coarse, green muscovite flakes were traced to gem-bearing parts of nearby dikes. Rarely was it difficult to find or recognize the dikes themselves, even on the brushiest slopes. Their riblike or bouldery outcrops and their prevailingly light color distinguish them from the adjacent gabbroic rock. Plate 11-B. Wall zone and line rock. Hariart Mountain. Vanderberg-Katerina dike, gulch east of Katerina mine. Wall zone of graphic granite forms upper three-fifths of dike, here about 16 feet thick. Most of remainder is line rock, with fine-grained unlayered rock along footwall. The pocket-bearing parts of the dikes formed good outcrops in some places, and yielded concentrations of quartz-rich float in others, but the spodumene-bearing parts of the dikes were nowhere well exposed. Thus most discoveries of kunzite in place were essentially happy accidents involved in the development of the pegmatites for other minerals. Plate 11-C. Wall zone and very coarse-grained pegmatite. Very coarse-grained perthite-quartz-muscovite-albite-lepidolite pegmatite beneath wall zone rich in graphic granite, Katerina mine. Large mass of lepidolite about one foot beneath hammer head. Prospecting of the pegmatites themselves was done by means of small open cuts and shallow pits, and in a few places the full width of the Stewart dike was exposed by means of shallow trenches. Most of these prospect openings are now obscured by dense growths of brush and by slumped material and other rock debris. Some of the holes were enlarged to form irregular bench-like cuts, and others were extended underground. Where the edges of the dikes were well exposed, as on the east side of Chief Mountain, exploratory drifts were driven along the parts of the pegmatites considered most favorable for prospecting. Few of them are longer than 100 feet. Inclines were developed for the same purpose in other dikes, especially on the east slopes of Hiriart and Queen Mountains. On most ridges and westerly slopes, in contrast, the prospecting was largely confined to surface openings. Whenever the results of preliminary excavations appeared to justify mining operations, open-cut work was carried on as long as the amount of barren overburden was not too great. The largest cuts of this type are those at the Stewart mine, and cuts and groups of cuts with maximum dimensions of 100 feet or more form parts of the Tourmaline King, Tourmaline Queen, Pala Chief, San Pedro, Senpe, Vanderburg, and El Molino mines. Underground work was done mainly from drifts and inclines of gentle to moderate slope. The workings commonly were interconnected, especially in the largest mines. Some represent series of irregular sloping tunnels and rooms between drifts, like those of the Tourmaline King, Tourmaline Queen, and parts of the Stewart mine, whereas others are unsystematic networks of both inclined and level openings. The few shafts sunk in the district were prospect holes or were used for mine ventilation. In four places with favorable topographic situation, efforts were made to tap lower parts of pegmatites by driving adits through the country rock, but none of these workings was continued far enough to accomplish its purpose. 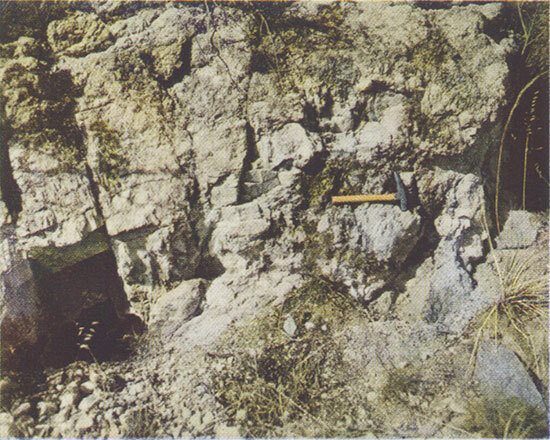 Most parts of the pegmatite dikes are hard and unweathered, so that drilling and blasting were necessary in nearly all mining. The finer-grained, sugary parts of the dikes are particularly tough, and require considerable effort in their removal. Most of the work was done by hand methods, and maximum advantage was taken of joints and other natural features in breaking up the rock. Compressed-air drilling and otherwise mechanized mining were typical only of some operations in the Stewart, Tourmaline King, and in one or two other mines. The softer parts of the pegmatites, particularly the quartz-spodumene units and gem-bearing pockets, were easily handled with pick and shovel in many places, and little blasting was required except in masses of lepidolite and albite-rich rock. The most effective tools for excavating the gem-bearing parts of the pegmatites were the screwdriver, chisel, small pick, bar, and hammer. Indiscriminate blasting ruined quantities of gem and specimen material in some mines before more careful methods of hand-tool excavation were worked out. Methods of handling the broken rock were generally very simple. The rock was loaded onto wheelbarrows, skips, or cars, and then lifted or trammed to the portal. Hand windlasses or mule-drawn whims were used for lifting at several mines. Much of the pegmatite in the Tourmaline King and Stewart mines was stoped and then carried by various combinations of tramming and chuting to the portals of lower-level adits. Most of the lepidolite and some of the gem material were sorted underground before tramming or between two stages of tramming, whereas most of the gem material was sorted from other constituents of the pocket pegmatite at the surface. Little timbering was required in most mines, and today surprisingly few of the underground workings are caved or otherwise inaccessible. In most places, single stulls or sets of timber sufficed to support the walls or backs of workings. A notable exception to this is the Stewart mine, where square-set timbers were found necessary in some haulage ways and ore passes. This was due in part to badly broken ground, and in part to the mining away of all but a few thin pillars in the lepidolite-rich parts of the pegmatite. Much of this timbering has collapsed since the mine was abandoned in 1928, in part because no lagging was placed between it and the intricately fractured back of quartz-rich and spodumene-bearing varieties of pegmatite. The elements of all square sets were alined horizontally and vertically, rather than normal and parallel to the westward sloping pegmatite units, so that some timbering was collapsed by oblique stresses during large-scale caving. Near some mine portals, at places where the pegmatite and wall rock are jointed, the weathered gabbroic country rock has caved. The backs of large rooms and other openings without adequate support have also caved, especially where the pegmatite is thoroughly fractured, as in parts of the Stewart and Katerina mines, or where it is cut by joints parallel to the hanging-wall contact, as in the Tourmaline King and Tourmaline Queen mines. In places, caving has progressively removed slabs of hanging-wall pegmatite, and part of the overlying gabbro. Ground water is no problem in the mines, even in the deepest workings. Indeed, it was necessary to haul water into nearly all workings during periods of active mining. The recorded annual production of lepidolite and clear spodumene, tourmaline, and other gem minerals from the Pala district during the period 1900–47 is shown in table 5. The total reported output of lepidolite and amblygonite, 23,480 tons valued at $432,800, is undoubtedly slightly lower than the actual, or combined reported and unreported totals, but is probably substantially correct. The average value of this output was about $18.40 per ton, which probably is slightly lower than the national average for the same period. This fact might be in part attributable to the low grade of the material that was shipped, but in part also reflects production during periods when competition from other domestic deposits was keen. Most of the other deposits are more favorably situated with respect to centers of demand, and some of them have yielded material of higher lithium content. The total recorded production of gem tourmaline, 2,980 pounds valued at $154,500, is incomplete in terms of both quantity and value. Production figures without data on value are available for two years, and value data without corresponding figures on quantity are listed for ten years. The total output comprises both rough gem material and some crystals of little but specimen value. Different mine owners and operators reported their production in terms of different kinds of material, so that figures for different properties—and even for the district as a whole during different years—have little comparative value. 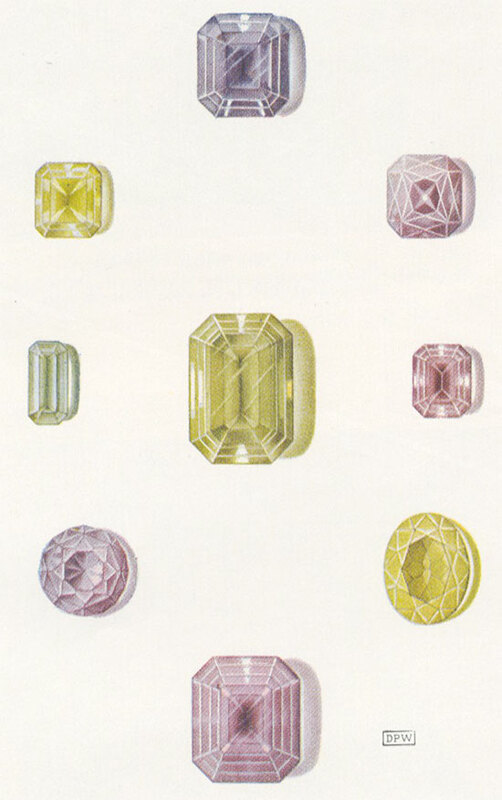 Probably more than two-thirds of the tourmaline production listed in table 5 represents rough gem material. The retail value of such material, in the form of its ultimate yield of cut gem stones, is approximately five times this figure. The data on gem spodumene probably constitute a reasonably complete record of the formal production from the district. Most of the material was obtained from the Pala Chief mine, but some was produced from other parts of the district, particularly from mines on Hiriart Mountain. The total yield, 1,325 pounds of rough gem crystals and crystal fragments, was valued at $152,900 or at an average of approximately $115 per pound. The production figures mean little in terms of year-to-year comparisons, as much of the spodumene was sold several years or even a decade or more after it was mined. In most instances the value figures are based upon calculation, using the price schedules that were current at the time the material was obtained from the ground. The information on production of other gem materials from the district, chiefly quartz and beryl, is far from complete, and the figures undoubtedly represent fairly small fractions of the actual formal production. Also, there is no means of determining the total quantity and value of specimen material taken from the district, although the figures must be large. The total value of all gem material for which there is a record of production from the Pala district is at least $319,200. This amount is less than the value of the lepidolite taken from the Stewart pegmatite, and is considerably less than the $2,000,000 reported for all recorded pegmatite-gem production in southern California. All figures for the output of gem material represent only those totals for which there is a written record, and hence they must be minimum figures only. Only incomplete records of production are available for some of the mines, and no records at all are available for others, the operators of which either did not keep or did not release such data. Perhaps even more significant is the total of gem and specimen material removed from the pegmatites by amateur collectors, and—more important—by active high graders. These high graders include miners who withheld for personal use some of the output during regular mining operations, and individuals who carried on informal operations of their own during periods when the mines were shut down. NR—no recorded production; _ _ _—no known production; a—approximate; b—includes nearly 800 tons produced during decade 1890–1899; c—Includes some amblygonite; d—Includes much material not of gem quality; e—totals incomplete. It is impossible to estimate accurately the total loss of gem material during the course of active mining in the district, but it must have been large. Also large has been the output of that picturesque group of energetic individuals who have mined the pegmatites from time to time without benefit of definite agreements with the owners. In many instances these men were remarkably shrewd in their interpretations of the pegmatite structure and the probable positions of desirable pocket material, and there is little question that in some mines they obtained a considerably larger yield of usable material per unit of pegmatite handled than did the actual owners of the mines during more regular operations. In contrast to the high graders, the numerous amateur collectors who have been active in the district probably have not accounted for such substantial quantities of gem crystals, except for many thousands of pounds of small or very low grade material. This is despite the great numbers of such persons, and the zeal with which they have scrutinized the deposits. Much of the material obtained in this way was waste rejected during mining and incorporated in backfill and in the numerous dumps. Although there is little basis for definite estimates, many persons familiar with the history of the district believe that the amount of gem material that has reached markets from the Pala pegmatites without having been recorded is nearly equal to the total of regular production indicated in table 5. Nearly all prospecting and mining in the Pala district has stemmed from discoveries of commercially desirable minerals at the surface, and much detailed search for such surface outcrops has been carried on since 1892, the first year of systematic mining. The yearly number of new discoveries was decreasing as early as 1905, and by 1916 it had dropped to a small fraction of its former magnitude. As mining was extended farther and farther into the exposed concentrations of lepidolite and gem minerals, they were either worked out or the operations were stopped for other reasons prior to their complete removal. More recent activities have been confined mainly to recovering the remnants of these concentrations, and it is clear that any large-scale mining in future years must be based upon the discovery of additional concentrations, few of which are exposed at the present surface. Near-surface pegmatite that contains desirable minerals can be sought out and exposed by rather simple means. Careful tracing of all pegmatites along their strike, with particularly close examination of their poorly exposed portions, might well yield helpful evidence of kunzite, lepidolite, or other pocket material. Attention should be devoted to those small, nearly flat areas that are strewn with angular fragments and large, subangular blocks of massive quartz. Several of them are present on Hiriart Mountain. The parts of such areas that are most likely underlain by pegmatite generally can be determined within narrow limits by projecting the trends of nearby dikes into them. The geologic map of the district (pl. 1) can be useful in this connection. The pegmatites themselves then can be exposed by means of shallow trenches and pits. 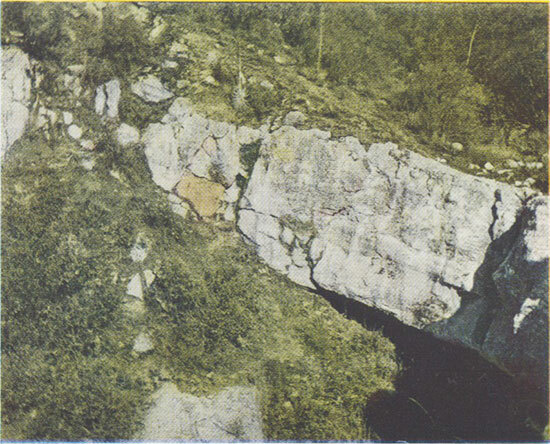 Concentrations of coarse, prismatic schorl in the hanging-wall part of the pegmatite, especially where the mineral forms radiating, downward pointing clusters. Large masses of coarse-grained anhedral quartz, or of quartz with coarse, euhedral perthite, especially where such masses contain small, irregular cavities that are lined with quartz crystals. Tabular to ovoid concentrations of coarse book muscovite, especially where this material forms tightly intergrown aggregates of books 1 inch to 2 inches in diameter. Lepidolite, either as veinlets, stockworks, or as larger, more equidimensional masses. Fracture fillings and stockworks of cleavelandite, particularly in pegmatite rich in coarse, anhedral quartz. Irregular aggregates of very fine-grained blue tourmaline, which appear as powdery to sugary masses interstitial to masses of coarse quartz-, spodumene-, or albite-bearing pegmatite. Hypogene clay minerals, especially in large masses that contain angular fragments of quartz. Euhedral quartz crystals, especially where these crystals have an opaque, milky-white coating; these crystals lie within the pockets themselves. Many of the pocket minerals occur as stringers and irregular but small masses in parts of the pegmatite adjacent to the main pocket horizon, and most large concentrations of these minerals are thus reflected by small-scale signs or outliers in zones nearer the walls. Such minerals, however, are by no means certain evidence for the existence of nearby gem-bearing pegmatite. Nearly all the gem spodumene occurs in pegmatites that contain large or widespread masses of coarse-grained quartz-spodumene pegmatite, ordinarily in the inner parts of the dikes. Most of the gem material is in the outer parts of the quartz-spodumene zones, where it is enclosed by clay, quartz, and cleavelandite, in places accompanied by blue tourmaline and beryl. In general, clear spodumene does not occur in pegmatites or parts of pegmatites that contain fine-grained lepidolite in great abundance. In most recent activities, further exploration of pegmatites in which is exposed some evidence of lithium minerals or gem concentrations has yielded poor to only moderately satisfactory returns. Such work appears to be headed in directions away from the desired concentrations, which have been either removed by erosion or mined out during earlier operations. The size of a dike does not appear to govern its internal structure, so far as the existence of pocket-bearing pegmatite is concerned. On the other hand, the largest masses of such material occur in the largest dikes, and particularly in the interior parts of bulges. In observing and determining the thickness and bulgelike nature of the dikes, however, care should be taken to distinguish individual dikes from composite dikes and also from dikes that branch or join. The attitudes of known bulges in some dikes, and particularly their direction and degree of plunge, might well be used to predict the occurrence of other bulges or large-scale rolls at greater depths. Structural terraces or benches, perhaps containing good concentrations of tourmaline, spodumene, or lepidolite-bearing pegmatite, can be predicted by similar extrapolation, but only tentatively in most places. Although relatively gently dipping parts of the dikes are commonly most favorable for the occurrence of desirable minerals, as in the Tourmaline King, Tourmaline Queen, Pala Chief, and several other dikes, there are notable exceptions. Segments of cores, and of other inner zones that contain many of the pocket concentrations, appear to be governed in their distribution by several different types of irregularities. Ordinarily they occur in the thickest parts of the dikes, but elsewhere they appear to be disposed in accordance with variations in the attitudes of dikes in which there is no perceptible thickening or thinning. In some dikes there appears to be evidence of minor structural features which may serve as a basis for downdip extrapolations. This is particularly true of several dikes on Chief Mountain, in which broad rolls and corrugations plunge parallel or nearly parallel to the dip. On the other hand, there are several pegmatites in which such structural features are not consistent. In the Tourmaline King dike, for example, a large and rich concentration of pocket minerals was encountered along a local flattening of the dike. Many thousands of dollars were spent in searching for additional concentrations of this sort, but neither such concentrations nor any flattenings of the pegmatite have been exposed. In the broadest possible terms, the most promising pegmatites for prospecting and further exploration are those that contain units rich in coarse, anhedral quartz. Many of these units are accompanied at the surface by showings of quartz crystals and other pocket minerals, and some of them have not yet been explored. Even where such minerals are not present, most occurrences of the typical milky to transparent massive quartz probably merit at least small-scale testing. Few of the pegmatites or parts of the pegmatites in which there are very sharply defined, garnet-rich types of line rock are known to contain satisfactory concentrations of lepidolite or gem minerals. 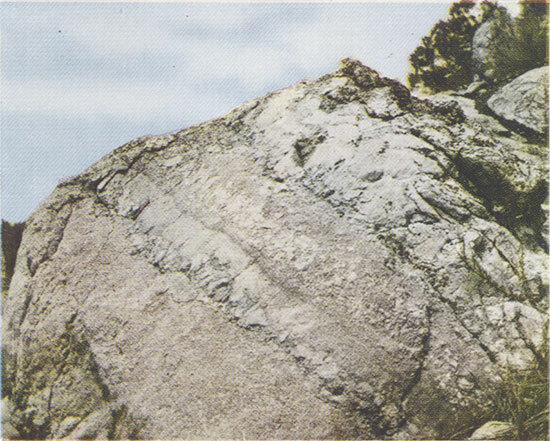 In most places where such line rock is exposed, it passes abruptly upward into barren, coarse-grained graphic granite. The general outlook for revival of activity and renewal of production in the Pala district is only fair. Exposures in several mines suggest that additional reserves of gem-bearing ground are present, and numerous surface prospects appear to be favorable. If the geologic relations or the returns from exploratory work justify expenditures for subsurface exploration, some entirely new concentrations might well be discovered. Certain it is, however, that these new concentrations generally will be more difficult and expensive to find than those already known and worked. 71. Krondel, Clifford, Tourmaline pressure gauges: Am. Mineralogist, vol. 33, pp. 1–17, 1948. 72. Pough, F. H., and Rogers, T. H., Experiments in X-ray irradiation of gem stones: Am. Mineralogist, vol. 32, pp. 34–35, 1947.